And also make sure you aren’t damaging your firearm. There are a lot of in between calibers that you might be able to get away with using a similar caliber, but it doesn’t always work. Anyone that reloads ammunition is going to know the difference between a 9mm bullet, 38 Special, 357 Magnum and a 7.62×39 caliber. You are talking about .311-.355 bullet diameters which all put them in 30 caliber ranges, but if you are trying to clean the bore and riflings, you aren’t going to clean them as well unless you use the correct brush. I’ve tried to cut corners in the past and noticed in some of my .357 revolvers that there was still lead build up in the chambers and the barrel if I didn’t use the correct gun cleaning supplies. Gun lubrication is something you should seriously consider auditing in your inventory. Much of the older stuff isn’t as good or it’s toxic and you should consider a total clean out. Modern lubrication like Slip 2000 or M-Pro Series lube is far superior to the old gun oils. Corrosion protection has also dramatically improved and that really makes a huge difference on blued guns especially many hunting rifles and shotguns. Check all the Gun Cleaning Supplies like cleaning brushes you are using and consider making sure you are matching the calibers to the guns, if you are using too big of a brush you might end up scratching up the throat or chambers of a firearm. Many military style firearms made these days are very easy to clean, it goes with the design of the firearm. Firearms like the M1 Garand and Even M14 have a unique design but are one of the few that are very difficult to clean from the chamber forward, until boresnakes came out. There are always some variables with the types of gun cleaning supplies you might need from gun lube, gun grease, cleaning brushes or even the boresnake caliber, but there is still a need to monitor how clean your firearms are, when you clean them. Sometimes people just do a quick wipe down, but I recently had a friend purchase an AR15 that was about 15yrs old but in almost perfect condition. He stopped over and I checked it out, and it was in almost “mint” condition, until I opened up the bolt carrier group and found an extremely corroded hole right on the bottom of the bolt carrier. There must have been something that got in there an stayed on the firearm while it was in storage. Something like that would be far more destructive if it was on the bolt head, or even in the hard to see barrel rifling. Pay attention to what kind of gun lubes you are using at check to make sure that it has corrosion protection. Many people are experimenting with synthetic oils these days, but many of them do not protect metal. Slip 2000 is one of our more popular brands we sell and I have learned to wipe down all of my firearms after handling them because even that rack queen can get messed up if you don’t open it up and check on. 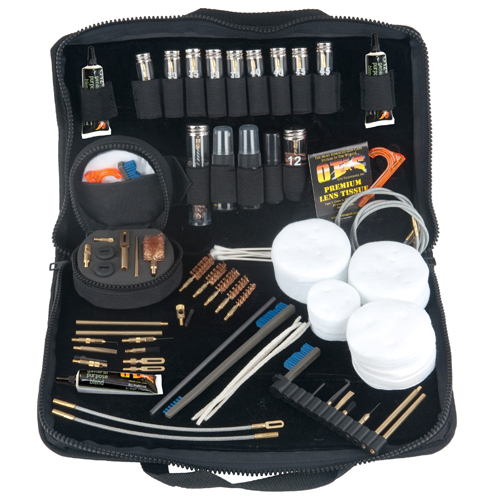 Do an audit of the “quality” of your gun cleaning supplies, are the brushes worn? Is your boresnake getting frayed and falling apart? A closet or even a gun safe that does not have good ventilation can have brief periods of moisture build up that can be extremely destructive to tools, firearms and even ammunition. There are also some variables with calibers and sometimes using a brush that works for 9mm, 357mag, 30 Carbine, 30/30 level action, might miss a few spots inside a barrel. I have a small light that can be inserted into the barrel, to do barrel inspections from time to time and the longer you own a firearm, the more you’ll realize you’ve missed a few spots. Accuracy can be impacted by this. We hear about Frog Lube, Fire Clean, M-Pro7 and know there are a lot of things that people can choose from to upgrade what they have in their basement. Slip 2000 products are something that I personally endorse after dealing with a Special Forces group that was shopping in our store and told us they used this in Afghanistan. Many of the older gun lubes like Rem Oil that everyone seems to have somewhere in their home, just won’t cut it with high rates of fire out of a semi-auto rifle. Rifles more than handguns have to worry about these things because putting 300rds of 5.56 through a rifle is going to burn off an inferior firearm lubricant and you’re going to have metal to metal and rapid deterioration caused by friction. Another thing we have delved into is the Slip 2000 725 Cleaning solutions that we have switched several police departments over to for their Ultrasonic cleaners. There’s nothing better than getting local phone calls from customers that said they saw us on the Slip 2000 dealer listing and were glad to find a local dealer that stocked this stuff. Buying gallons of cleaning solution or spray bottle is a pain in the next to ship unless you buy the 4 gallon cases and shipping charges can be high due to the weight. We’re still running our Slip 2000 Sample promo so stop in and ask for it when you are here. I highly recommend running your new AR15 build with Slip 2000 EWL and also consider the Slip 2000 gun grease for long term storage or for hammer springs or other high friction areas. If you use the right firearms lube you’ll notice that after thousands of rounds, the gun won’t be worn down as bad as someone who’s cutting corners. There is a very small percentage of people that are going to think they still need a single piece cleaning rod with a brush to scrub their barrel clean but the one thing that I have found in this industry is people often “over clean” firearms and you can tell if you check the chambers and the crown of a barrel. Unless you are shooting a sub-moa rifle, I really don’t think it’s something to worry about. Boresnakes don’t bend on break unless you put the wrong caliber in your rifle, I’ve seen it happen and it’s a royal pain to get unstuck but that’s not the products fault. The really difference between the pistol boresnakes and the rifle boresnakes is the length of the string, it’s annoying to use the rifle snakes on pistols because you’ll have too much slack. Just pickup a bottle of Slip 2000 EWL for most rifles, especially for the AR15 style of guns and if you get to cleaning your rifle right after you get done with a range session, it should come right off the rifling. 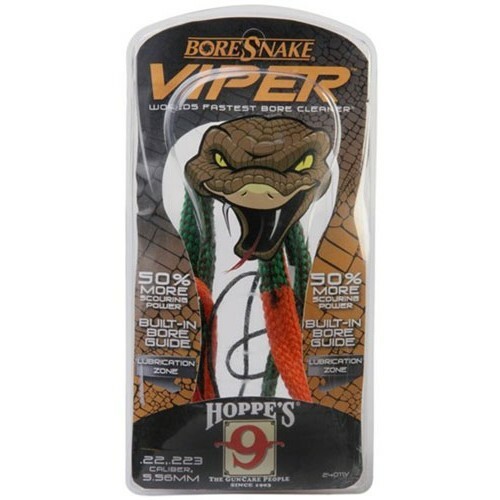 I’ve used Hoppes boresnakes for close to 20yrs and only one wore out a 22 caliber one. Once they get really dirty, just toss it in the wash machine to clean it off. Slip 2000 Gun Cleaning Products Promotion Coming Soon!! We have been big fans of Slip 2000 gun cleaning products for a lot of reasons. I’ve blogged about them before but we are still dealing with a high number of customers that don’t know that synthetic lubricants that work in your car are probable excellent options for your firearms. The biggest positive thing I’d say about Slip 2000 is that it actually stays on the guns and I have yet to actually heat up a gun enough to the point where I didn’t see anything left. In my opinion, if you can’t see lube on your firearm, it probable isn’t there. I’ve seen guns start to fail at the end of matches several times because the number of rounds you run through a firearm doesn’t mean the gun lube you are using is fine, it just means you may have not pushed the limit of the lubricant you are using and if you ever run a gun hard, you better watch out. There are several product and sizes to choose from and it’s often better to buy the larger bottles because in the end, you save money. Slip 2000 gun cleaning products like the Copper Cutter and the 725 gun degreaser are all in my cleaning area and I don’t feel the need to jump around to other brands when I already found something that works. I have also added the Slip 2000 EWL30 on some of my .308 Semi Autos. We will have a FREE SAMPLE display in our store for anyone interested in trying it out. So plan on stopping in later this September for our Slip 2000 Promotion. We still get people that are using 3 piece cleaning rods and out dated gun cleaning solutions like Hoppes #9, and if you want that toxic stuff in your cleaning kit, that’s your call, but there is a certain point you should really consider getting rid of some of the chemicals in your home, and at a certain level of being exposed to lead and other toxic materials in this industry, using gloves, good ventilation are things that are going to prevent bad things from happening. Since I own so many 22 caliber firearms, my 22 Caliber boresnake and a once piece rod for 30 caliber semi-auto and bolt action guns are pretty much the majority of my cleaning tools. Shotguns are a joke to clean and often my least cleaned firearms, but making sure they have a level of corrosion protection on them is pretty much all I worry about. 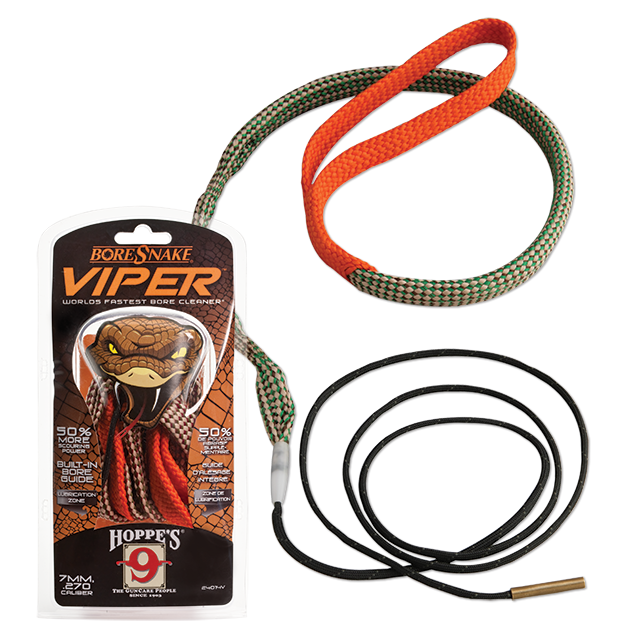 The only difference between rifle and pistol Hoppes Boresnakes are the length of the cord. I still have a pistol rod that gets used on AR15 chambers because a boresnake isn’t going to get into all of those chamber areas, i’ve found that if you clean bolt action rifles right away, boresnakes get lift all of the crud out and you won’t need to resort to cleaning patches or cleaning rods, if you do wait it might take some more effort to clean the rifling. Boresnakes general, when it comes to calibers, but I do have some issues with revolver cylinders not getting cleaned with boresnakes. I still have to take a q-tip to clean out my Ruger Single Six, probable because lead and not copper coated bullets do the dirtiest work, so don’t expect these Hoppes snakes to work for everything, but when they work, they really do save time. I sometimes feel as though I need to take a couple training courses every year to just learn what is going on in the industry, but I often do a lot of listening and asking questions and probable spend at least an hour a day researching something on Youtube.com to see if the manufacturer has a Youtube Channel or if a reputable blogger or writer has something to say. Reading specs off of paper takes time and is harder to comprehend sometimes and we’re real happy with companies like Leatherman Inc to have such a good youtube channel so we can just pick a product and watch all of the features. If you know what you want then you’ll have to do some research into each tool because need a punch, screwdriver, or hammer all have different purposes and if you use a tool incorrectly you’ll ruin it. Right now the Leatherman OHT is the our 2nd highest selling tool since it’s so easy to handle “One Handed Tool” and has most of what you would use a multitool for. 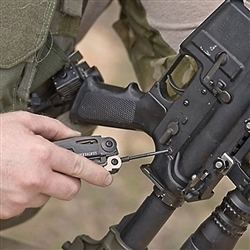 The Leatherman Wingman and Leatherman Wave a bigger sellers for Police and the Leatherman Raptor is practical uniform gear for EMS and SWAT Medics, we also have FBI medics in the area using them. I’ve been eyeballing the Leatherman MUT for a long time but just feel it comes a little short on what I would want to use it for. For $159.85 and not having a broken shell extractor falls just short of perfection. Always be aware that the Leatherman multi-tools can come in a Brown or Black Nylon case and some also come in leather cases. Just like many things out there, you do have to be very careful what you use when cleaning your firearms. There are gun cleaners that will strip every bit of grease and grime off your gun, but you better remember to lubricate it again. People forget that there are many mechanical pieces of metal in motion and if they don’t function correctly you’re going too shorten the life of the part or have an unreliable firearm. I’ve been on the range enough times to see and hear differences in timing and cycle rates when firearms are lubricated correctly but not everyone will know to look for it, I guess it comes from having a musicians ear. You may want to consider different gun cleaning supplies for different firearms. Bolt action rifles, semi-auto rifles, handguns, revolvers ect. There are always those hard to reach parts like the chamber of an AR15 and if you don’t have the correct chamber brush, it’s very hard to clean. Revolvers are another thing, I still use q-tips on some of my firearms especially on revolvers, I often find that cleaning the cylinders is very difficult with just cleaning patches. It also does matter what type of ammo you use. Also, remember that cleaning too much can damage a firearm, little things like guide rods can prevent damage and maintain accuracy on a rifle. There are a lot of technological changes taking place with synthetic oils and I have a ton of friends that are using things like Mobil 1 on their firearms, but if you are a hunter, you have to pay attention to lubricants that have rust corrosion abilities. I’ve had my stories in previous blogs but I have lawn chairs and grills that I never paid attention to and watched them decompose over time because screws rusted or hinges corroded. You can extend the life of a firearm if you keep in from rusting out and although we are getting close to having composite material rifles, there are plenty of things that can rust through or wear out like gun springs and trigger springs if you don’t watch how you maintain them. The beauty of modern gun cleaners like Slip 2000 and Frog Lube are that they are going to clean, lubricate and protect your firearms and also non-toxic. We’re working on some restocks of our best selling items this year and there are some really good Slip 2000 gun cleaning packages with bore cleaners and copper cutters that you might want to think about. Gun cleaning supplies like boresnakes and one piece cleaning rods are going to make your life easier and I highly suggest using both. 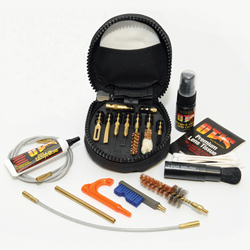 Otis gun cleaning kits tend to be better for those that are mobile and might be doing cleaning on a trip. We have several Border and Security personnel that use them while they travel State to State for Carbine Instructor courses. Having the correct chamber brush for an AR15 is the difference between cleaning the chamber and not cleaning the chamber. And don’t forget that taking your magazines apart and checking them from time to time for rust and corrosion is another way to make them last. I’ve seen base plates rust out and drop fully loaded mags on firing ranges. A slight wipe down of a protective lubricant can stop all of this. Do you still need a cleaning rod for your rifles and what gun cleaning supplies should you consider? I have atleast 2 Hoppes gun cleaning kits that I purchases probable more than 20yrs ago and never finished off all of the gun oil that they came with because I never really needed to use that much lube on the bolt action rifles I first owned. The one thing I learned real fast with a 22 Caliber rifle is to not get your 30 caliber gun cleaning patches mixed in because any 3 piece gun cleaning rod is not going to handle being stuck in a barrel and will easily get bent up and you might as well consider it trash due to the fact that it’s highly likely you’ll damage the riflings in the barrel. I learned that lesson and picked up a one piece rod and it’s still in great condition. There are several different types of metal brushes you can use but in my opinion its more about how you clean the firearm and not so much about the make up of the brush. Brass rifle brushes, Nylon brushes and even Bronze gun cleaning brushes. Most of the type you can use a given rifle caliber brush on several calibers that might be close to it and it will get the job done. I’ve actually avoided worrying about cleaning all of my firearms after every range trip because I’ve seen so many semi-auto guns run just fine for thousands of rounds just because they were properly lubricated, and not because they need to pass a white glove test. 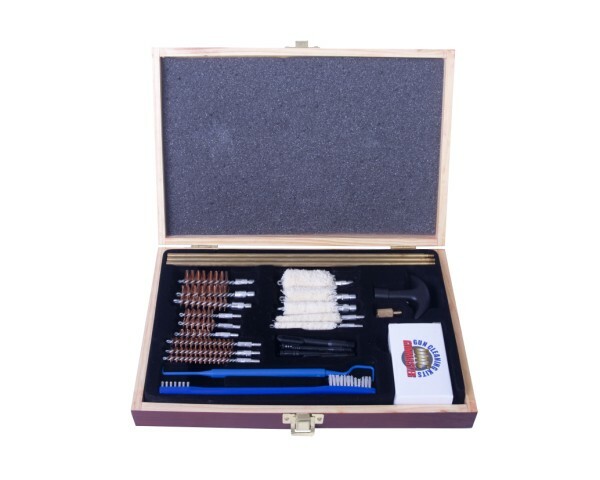 Whether you are looking for a kit or few gun cleaning supplies to cut your time down, the type of gun you are using and the configuration the kit comes might mean not needing much more. 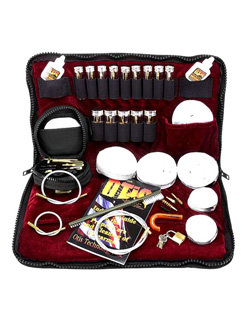 Some of the Otis gun cleaning kits are caliber and rifle specific which is pretty cool if you want to keep it in a range bag or you are going to be on a road trip. Some of the .308 or 7.62 gun cleaning kits have optic cleaning tools which is something you might not have thought about until reading this blog post. A Leatherman Mut might be another accessory to keep in the same bag.